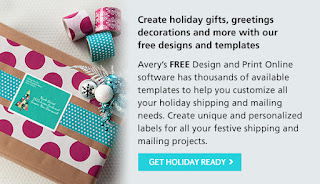 Deck the halls and add boughs of holly to envelopes, boxes and more with Avery! From decorating to shipping and mailing, it's easy with Avery products. Customize all your personal or business holiday projects with a personalized touch. Choose a FREE festive design from their design collection or upload your own design to create dazzling holiday labels, thoughtful cards or festively decorate gift boxes. Specialty Holiday Labels, Shipping and Mailing Holiday Labels, Easy-to-Use Holiday Templates, plus Ideas and Inspiration! Just personalize, print and gift!